..the start of our very first challenge and we are so excited about your awesome responses to our invitation! for all the best wishes, for so many of you already having become followers and for all the lovely comments with loads of encouragement for our steampunk adventure! For all those who stop by for the first time a warm welcome and, please, scroll down to the previous post to get information on our challenges and the how tos. We look forward to sharing some awesome challenge-times with all of you! A hearty welcome and hello to you, dear crafting friends (and those still to become), who do us the honour of stopping by our new (and very first) Challenge blog! Thank you all so much who stopped by to join in this thrilling new adventure this is for us! 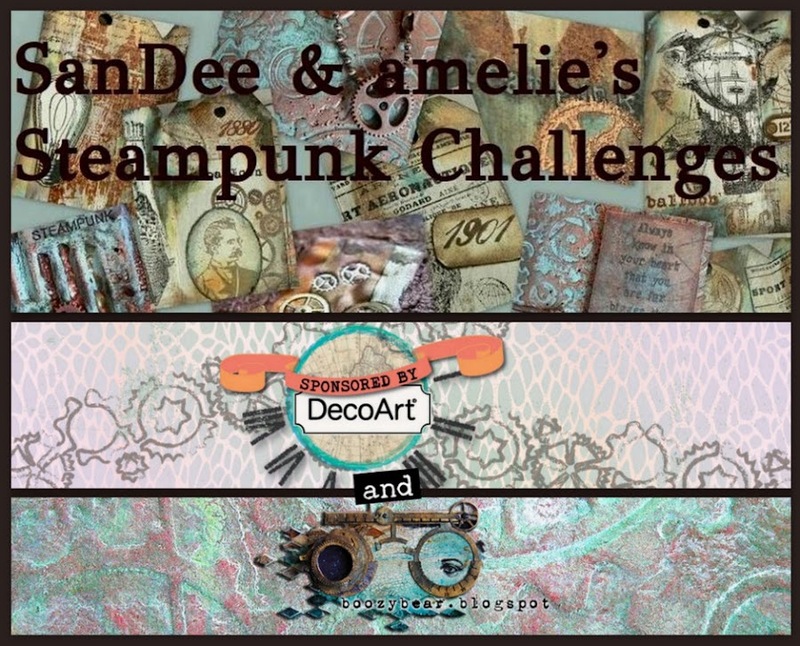 As SanDee and me (die amelie) are quite addicted to Steampunk, we had been looking out for stamping/crafting challenges for quite some time that would fit our personal needs - only to find that we didn't find "the right thing". 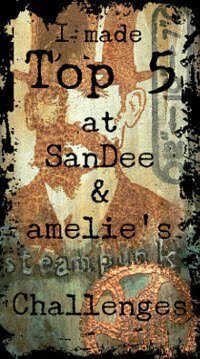 So we decided to create a challenge blog on our own, where we could invite others to play along with us and share some splendid Steampunkery from time to time (which means monthly ;). We hope that this place will soon be crowded with paper crafters, stampers, ATC- and mixed-media artists, taggers,...people who share that special interest and have fun. We want this mainly to be a Steampunk challenge blog, but we are aware of the fact that Steampunk isn't quite to everyone's taste. Therefore we decided to accept also grunge, timeworn, Victorian or vintage look projects - as long as they were given at least a tiny twist towards Steampunk. We want our visitors to enjoy themselves with our challenges, maybe even sometimes take a step out of their comfort zones. Our first challenge goes online on March, 1st! Whoop, whoop! 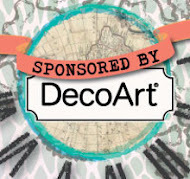 Well, let's see how this challenge blog turns out (we are shivering with anticipation to be honest)... with your help we can make this a wonderful little corner to meet 'n greet, sometimes pull each other out of one's comfort zone and share our drawn, painted, stamped or hand crafted treasures and artwork. So we look forward to enjoying some awesome challenge times with you!